A view of the monument in memory of Mrs. Eleanor Roosevelt which was dedicated at United Nations Headquarters on 23 April 1966. The monument has been erected by the Eleanor Roosevelt Memorial Foundation, a private philanthropic organization, at the north-east corner of the United Nation garden. The ground was made available by the United Nations as a tribute to Mrs. Eleanor Roosevelt. 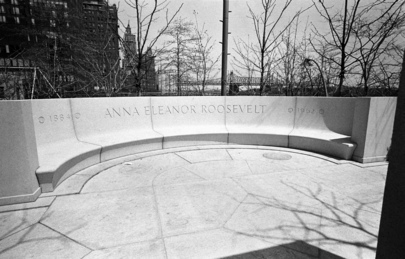 The monument consists of a semi-circular granite bench with the inscription: "1884 - Anna Eleanor Roosevelt - 1962"; and a tall slab facing the bench showing a bas-relief of a flame and bearing the inscription: "She would rather light a candle than curse the darkness and her glow has warmed the worlds".